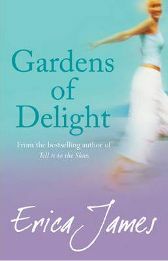 Erica James is quite a well known contemporary writer and ‘Gardens of Delight‘ is her eleventh book. I have read all of her previous novels, all of which I enjoyed, and I have to say that ‘Gardens of Delight’ was just as good as all the others, if not better. The story is centred on a small group of characters who live in a small village in Cheshire. The one thing that connects pretty much of all of them is their love of gardening and their involvement in the local gardening club. The three main characters are Helen, Conrad and Lucy. Throughout the book we follow each of their separate stories although these become more and more intertwined as the story progresses. Helen, although middle aged, has only recently married. However she is already realising that she may have made a mistake, but does not know what she can do in order to improve her situation. Conrad looks after his elderly, and somewhat ailing uncle, Mac, but his tragedy is that he is still mourning the unexpected death a few years ago of his young and beautiful wife. Lucy, although an independent young woman, has never really got over her father leaving her and her mother when she was fourteen, and is unable to find it in herself to forgive him. The first part of the book takes part in their village of Swanmere. We learn lots about these characters and their feelings as Erica James develops them all in an entertaining and absorbing way. There are also other interesting characters too – Conrad’s uncle, crotchety but with a heart of gold, Helen’s successful but bullying husband, Hunter, his spoilt beautiful daughter Savannah and Orlando – Lucy’s ‘best friend’ but everyone else thinks there is more too it! As the story moves along, little things start to happen that build the tension between the characters, for example Lucy does not approve of Orlando’s blossoming relationship with Savannah! By the time the gardening club decides to book itself on a ‘Gardens of Delight‘ holiday to Lake Como, tensions are brewing nicely! In particular, this could be because that’s where Lucy’s estranged father moved to many years ago after moving out and marrying his lovely Italian wife. So, the story then moves to the village of Bellagio by Lake Como and the story certainly moves on a pace. I shall not say much more in case you do want to read it, only that it will keep you wondering right to the end what will happen. And before you reach that point, you will have gone through a lot of heartache, worry, soul searching and reconciliation with these characters! I really enjoyed this story as it is based more on characters than actions. All the characters are well developed and it is possible to empathise with them and their dilemmas. The story moves on at a good pace – I often found that I was able to predict the next turn of events but this didn’t in any way lessen my enjoyment. I also liked the part which was set in Lake Como, an area I have visited in the past. There was vivid description which really added to my enjoyment. The book is a good length at with almost 480 pages but it is very readable because of the author’s ability to tell a good story. So if you like intriguing stories and are interested in people I am sure you would enjoy this book. No Comments on "Gardens of Delight"